I’m going to have to try this. It sounds wonderful. I hope you do Maralee! The raspberry flavor is so strong and delicious, and if you make enough of it you can enjoy it the rest of the year when raspberries are not in season. It looks so darn good! Especially the raspberry lemon….yum, yum, yum! I don’t expect you to remember everything I post! Happy (almost) Halloween! OH MAN. Those look spectacular. I used to pick raspberries at camp and at the park when we lived in the midwest, but raspberry bushes are few and far between in CA. 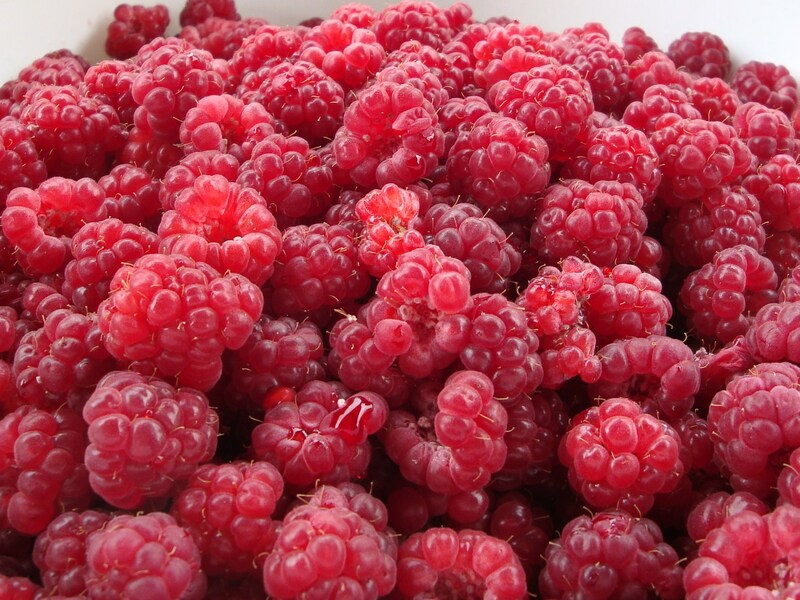 I really need to buy all the raspberries I can carry home from next week’s farmer’s market. In the meantime, I’m super jealous of your backyard haul, and the fabulous results! 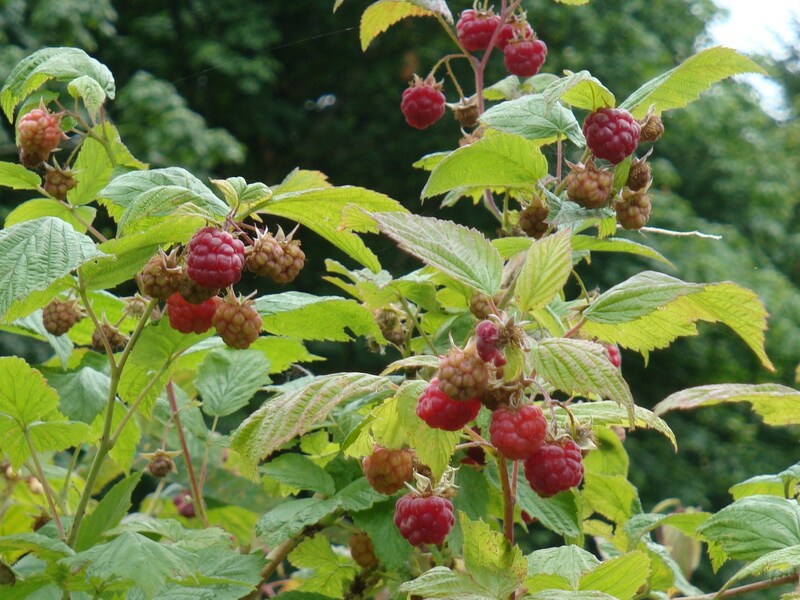 Thank you for the inspiration, I have made tonnes of raspberry vodka before and have a fabulous crop of the juicy fruits this year. I am going to start new interesting varieties this weekend, can’t wait. Roll on three months. 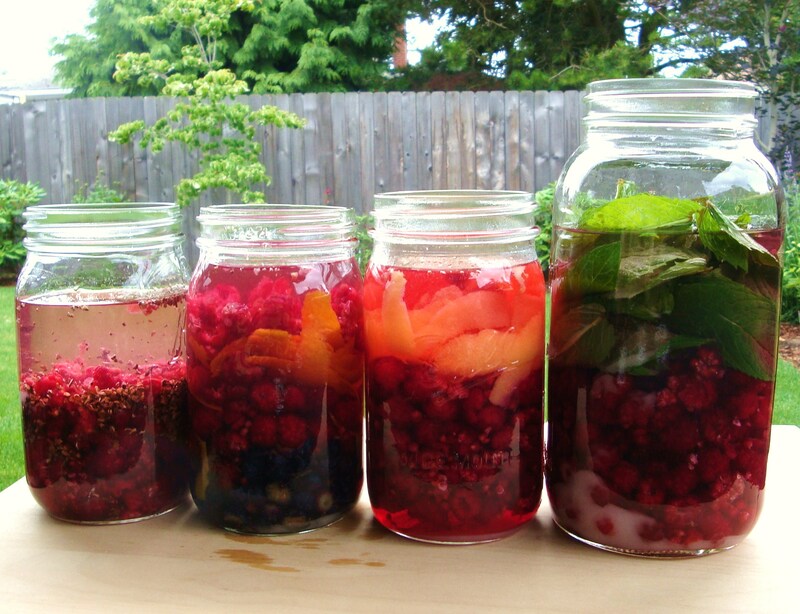 We love infusing our vodka with fresh fruits. Definitely want to try it with rum, now! 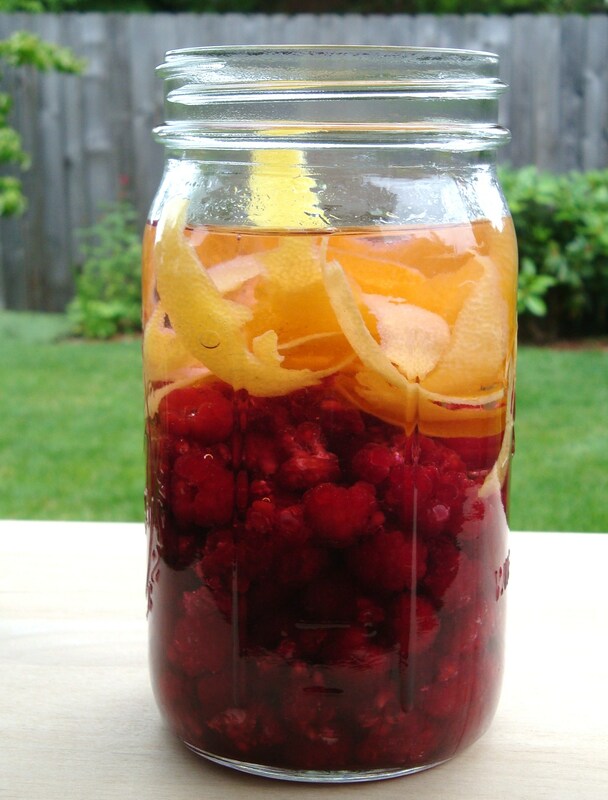 Do you have a favorite fruit-infused vodka? Great post, great recipes … great Scott! I think need a drink and it’s only 10 am! Hi there, thank you! I am glad you liked the post and hope that you will find some inspiration for your own infusions. I saw on your blog that you have started some infusing as well! What brand of vodka do you suggest for making liqueurs? Hi Rachel, great question. Many people like to use their favorite vodka, whatever brand that may be. And while many will tell you that your drink is only as good as the worst ingredient, I believe that a “middle of the road” spirit is best. You don’t need to buy the most expensive, but usually don’t want the cheapest either. They will all infuse well, so it partly depends on how much you want to spend and what you normally enjoy. In places where alcohol is very inexpensive, I would say go ahead and use your favorite. But if you live in a place with lots of taxes on alcohol and don’t want to spend that much, you would be fine going with a lower grade. I think Stoli and Smirnoff are just fine for most infusions. I think you make some awesome infusions , I’m currently making a Strawberry & Sweet Red Chilli, I would like to clarify something , in your recipe you say 1c, do I take it you mean 1 cup,??? Glad you got our info from Cocktail Lovers. Please let me know if anything else needs clarification. Oh and Mike, the strawberry and sweet red pepper sounds really interesting! Good inspiration there! 04.30 in the UK but I do my best researching at this time of the night. Hope your infusions turn out great! Cheers! Thanks Sweet Heat! They really are amazing! These are still infusing in our pantry, but the raspberry chocolate is really something special. All the raspberry infusions are great, but that one really stands out. The ROB rum is coming along quite nicely as well. 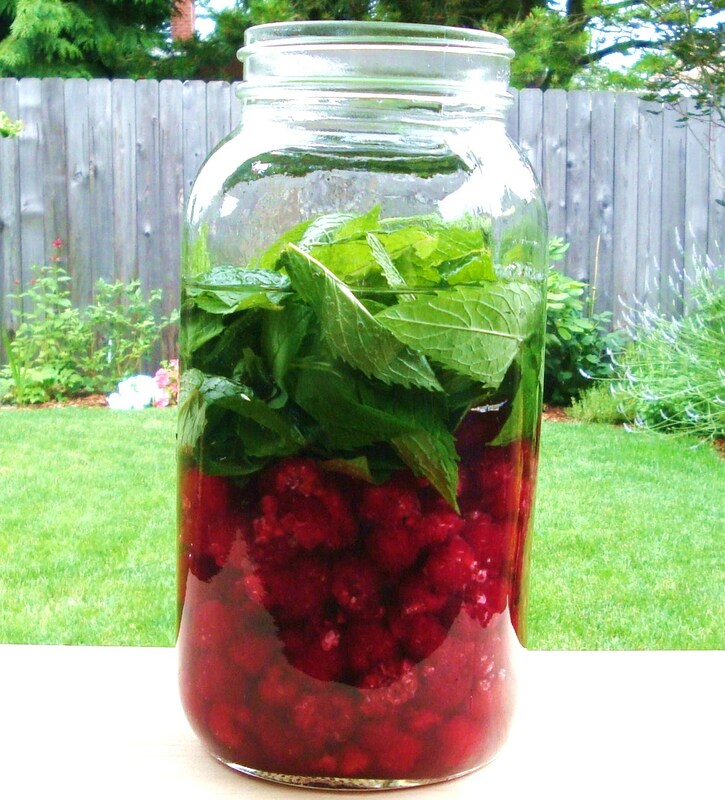 Hi, What variety of mint did you use with the raspberries? Think I might have to try this one! Well, a year and a bit later on….. I infused the raspberies and spearmint for 3 months. Tried the result and found it a bit harsh. Left it alone till now and now it’s fabulous!! Needed a bit of time to mature. Wish I had made more this summer. For your ROB Rum, what kind of rum did you use. Looks like you used a light, but what brand if you don’t mind me asking? Hi there, yes, I did use a light rum. It was nothing special, I think it was Bacardi. I usually use about that level of spirits in most of my infusions. I keep the good stuff for simpler cocktails or using on their own. Hi. Not that there’s anything wrong with Bacardi (what rum snobs hate to enjoy), it’s one of the most versatile rums. I use the Cruzan just as much. Yet I agree with you about finer rums. Thanks for sharing. All looks good. 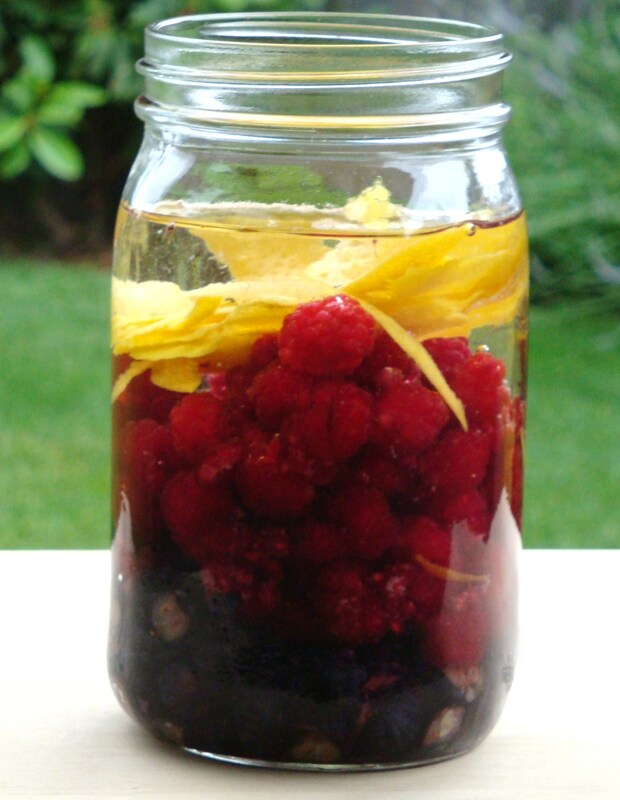 I made raspberry and almond gin a couple of years ago, I have not bottled it yet. Any ideas what to do with the raspberrys after the gin has been bottled. Wow! Thanks for all the inspiring combinations! Silly question but what would you suggest mixer wise for the chocolate raspberry vodka with? I am also thinking of these as Christmas gifts. The chocolate-raspberry vodka is really delicious on its own, just sipped as a liqueur. I think it would also be delicious with vanilla vodka and a little creme de cacao. That may be a bit stronger of a cocktail than you had in mind. If so, try mixing with a bit of milk or cream to thin it out. You could also try it with some club soda or tonic. But I think my cocktail suggestion would be 2 ounces of chocolate raspberry vodka, one ounce of vanilla vodka, and one ounce of lit creme de cacao. Shake all ingredients with ice and strain into a chilled martini glass. 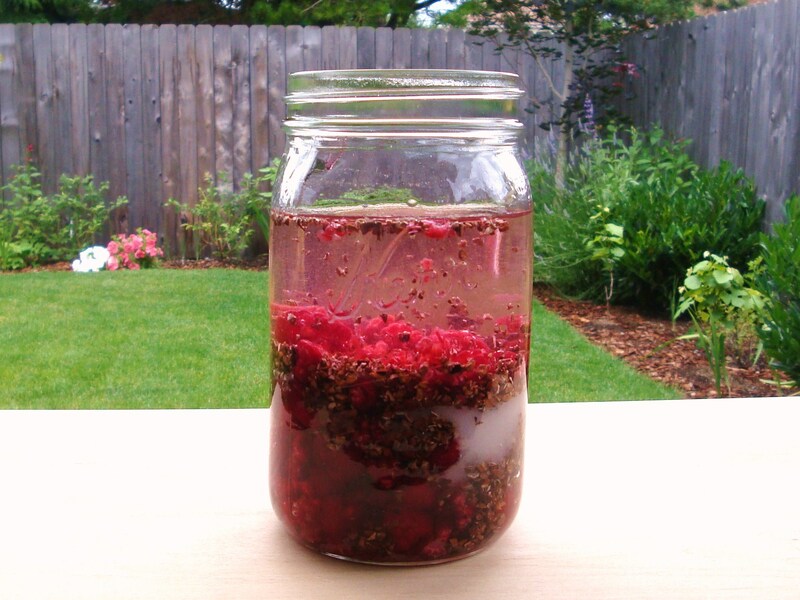 I found you here while looking for advice on raspberry gin infusions, as the one I’m currently making is a few days in, and gross. But, really, I’m won over by the chocolate raspberry infusion, and curious if you thought it would do as well in gin as the vodka. Thanks! Beautiful site. Thanks! I think the flavor of the gin would clash a little with the cocoa nibs, but it really depends how strong the botanicals are on your gin. If you used a pretty neutral gin it might be ok. Did you try it? You could absolutely use frozen raspberries. I’m sure it will be delicious. Love these ideas! Not finding Cocoa Nibs in my local grocery store. Any possible alternatives? I usually get them at a chocolate shop but you can also find them on Amazon.